This blogpost appeared on Place for Truth, a blog of the Alliance of Confessing Evangelicals. It is used here by permission of the author, Simonetta Carr. In 1618, the situation in Europe was tense. The Thirty Years’ War (1618-1648) was only a natural consequence of the religious and political conflicts of the previous century. On top of this, the Protestant camp was becoming dangerously divided by what many recognized as a semi-Pelagian tendency at best – an attempt to attribute our salvation to anything other than Christ alone, by grace alone, and through faith alone. This tendency became evident when Dutch professor Jacob Arminius gave new interpretations to Paul’s Epistle to the Romans – particularly chapter 7 and 9 – questioning doctrines which had until then been historically accepted (such as a Christian’s battle against a sinful nature and God’s eternal decrees). After his death, his teachings gained followers, who became known as Remonstrants (later Arminians). 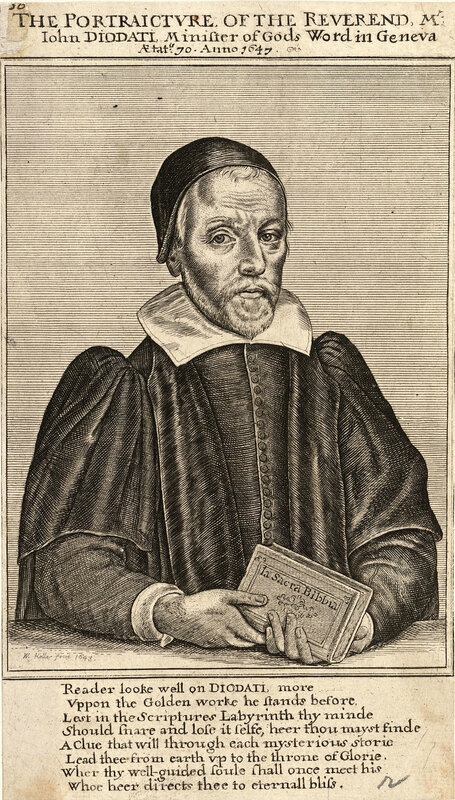 The Remonstrants’ questions spread throughout the churches, fostering division, so much that in the Low Countries there were Arminian cities and regions, with rulers fighting against each other. The advance of a Contra-Remonstrant leader, Maurice of Nassau, allowed concerned Dutch theologians to gather an international synod in the city of Dort (Dordrecht) to discuss the Remonstrants’ thesis. The delegation from Geneva included an Italian – Giovanni Diodati. In reality, Diodati had no desire to travel to the Low Countries, and suggested that his nephew Bénédict Turretin (who would become father of the renowned Francis) take his place. Turretin was, like Diodati, a theology professor, who had already shown diplomatic skills. In some ways, it might have seen a better choice, especially since the Genevan delegation was also given the task of negotiating with the Dutch authorities for a remission of financial debts. In any case, his request was denied, and he dutifully left for Dordt with his colleague Theodore Tronchin. Overall, it was a good choice. Diodati had demonstrated a remarkable faithfulness to the doctrines of the Reformation, an impressive spirit of initiative, and a sincere concern for the church of Italian refugees he pastored in Geneva. Besides, he was well known and respected all over Europe – mostly for his activity as Bible translator and his active efforts to promote the separation of the Republic of Venice from the Roman Catholic Church. Giovanni Diodati was born in Geneva on June 3, 1576. His father Carlo was among the Christians who had emigrated from Lucca ten years earlier, after the evangelical ministry of the Reformer Peter Martyr Vermigli had provoked a harsh papal reaction. In spite of his young age (he was only 25 when he arrived in Geneva), Carlo became one of the most prosperous and esteemed merchants in the Swiss city, earning the means to give Giovanni the best education. Giovanni excelled in his studies at the Geneva and Herborn Academies, becoming doctor of theology at 19 and professor of Hebrew at 20. He went on to teach the Geneva Academy, earning a reputation as one of the best linguists. In 1600, he married Maddalena Burlamacchi, also from Lucca. Together, they had nine children: five boys and four girls. Besides teaching, he pastored the Italian church in Geneva. His hopes of seeing a biblical reformation in Italy soared when, in 1604, the Republic of Venice launched an open challenge to papal authority and its blatant corruption. He visited Venice twice, under the pseudonym of Giovanni Coreglia, and worked with others to the realization of this dream – particularly with Venice’s official theologian Paolo Sarpi, two English ambassadors (Sir Henry Wotton and Sir Dudley Carleton), and the Huguenot leader Philippe Duplessis-Mornay. At the same time, he worked enthusiastically on the translation of the Bible into Italian – the first translation from the original languages. He published it in 1607. For a while, his dreams seemed encouragingly within reach. In 1609, he wrote Duplessis about the situation in Venice, “Things are getting progressively better. The number of evangelicals is greatly increasing. They are thirsty for my work and wish for me to move there immediately. I am committed to accept this holy and desired call.” He had planned to move to Venice in August but warned his friend that the pope’s spies were active, as shown by the recent destruction of the Italian Bibles he had sent ahead. He had five proposals for a plan of attack: increase the influx and production of Italian Bibles and evangelical books in Venice, send Protestant students who were eager to learn the language and evangelize, find a local person willing to coordinate the efforts, plant a French church under the protection of the ambassador of the Low Countries, and create diplomatic relationships between Venice and the Protestant German states. Some of these suggestions began to be implemented. Even Henry IV, King of France, showed his interest in this proposal. Eventually, however, this dream vanished for a variety of reasons. The Roman Catholic Church lured the Venetian authorities with an attractive compromise, Sarpi moved slowly, the church authorities intercepted an incriminating letter by Diodati (forcing the named individuals to withdraw their participation to his pursuit), and King Henry was murdered by a Roman Catholic fanatic. Diodati’s reputation preceded him at Dordt, where his opinions were welcomed. He particularly impressed the assembly with his speech on the perseverance of the saints. As his compatriot Girolamo Zanchi, he was convinced that, when God begins a good work in believers, he brings it to completion (Phil. 1:6) purely because of His faithfulness (2 Tim. 2:13). It wasn’t by any means a new doctrine (the Canons of Dordt recognized God had “most abundantly revealed [it] in his Word”), but it had never been formally included and examined in a Reformed confessional document. It was also one of the most pastoral heads of doctrine, helping Christians to deal with the perplexing contradiction between a desire to obey God and the “remains of indwelling sin” – a contradiction Arminius had tried to deny. Diodati was also part of a drafting committee who worked seven or eight hours a day for three weeks. Overall, he was one of the hard-liners who admitted no toleration of the Arminian doctrine. At the same time, he emphasized the need to avoid bitter partisanship, work toward unity, and maintain a pastoral approach toward the Remonstrants who were sincerely looking for the truth. While he doctrinally agreed with Francis Gomarus (a disciple of Zanchi), he denounced his combative spirit. He communicated this peace-making attitude even in his speech on perseverance. “I believe I have sweetened a little the vexed spirits of the previous, sour polemics,” he wrote Turretin. He also emphasized the need to keeping both the debates and the drafts free of academic terminology and applied this conviction to his speech. Thanks to Diodati and other like-minded participants to the Synod, the resulting Canons of Dordt were written in a pastoral, simple language that can be easily understood. While at Dort, he preached in different settings, including the court of Maurice of Nassau, who invited him to teach at the University of Leiden (Diodati refused). He was also able to make useful connections, to share with others his experiences as Bible translator, and to accomplish his diplomatic mission for the City of Geneva. Today, Diodati lives on for his translation of the Bible into Italian (particularly his 1641 edition), which was extensively used by Italians abroad as well as smuggled into Italy (where it was repeatedly confiscated and destroyed until 1870, the end of the pope’s temporal power). A new version was printed in 1991 (although a 1911 translation by the Swiss-Italian Giovanni Luzzi has the advantage of taking into account new textual discoveries). In his day, Diodati’s translation of Sarpi’s History of the Council of Trent was equally popular. His translation of the Bible in French, however, was not as welcomed, mostly because the Jesuits used it to deride Protestants for their abundance of Bible translations. Convinced of the validity of his work, he financed the publication, ending his life in 1649 in poverty and debt. While Diodati’s participation at Dordt was only a short episode in his life, today his intervention is appreciated as one of the reasonable voices that helped the Synod to reach a successful theological compromise while preserving the essential teachings of the Protestant Reformation. Eugenio de Budé, Vita di Giovanni Diodati, Claudiana, Florence, 1870, p. 30 (my translation). Quoted in Nicolas Fornerod, “A Reappraisal of the Geneval Delegation,” in Aza Goudriaan and Fred van Lieburg, eds., Revisiting the Synod of Dordt, Koninklijke Vrill NV, Leiden, The Netherlands, 2011, p. 206 (my translation).